This entry was posted on May 10, 2016 by Texas Safety Supply. 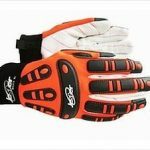 Impact gloves have progressed a lot in the recent years due to introduction of more innovative technologies used in the design and construction of Impact Gloves. The oil and gas industries recognized the need for Impact Gloves while they encountered these issues during the rugged and hazardous duties performed during a Roughnecks work hours. Safety should be the primary concern for industries and construction fields and adopting these Impact resistant gloves can help reduce the hand injuries to a large extent. It was a challenge for even the manufacturers to construct the oilfield gloves that can take the impact resistance needed in various hazardous situations like cuts and abrasions. Impact gloves are time tested products and ensures an optimum impact protection against Potential Oil Rig injuries. Real time industrial hazards are quite large in number for those working in the Oil and Gas Industry. Most common are the mechanical abrasions, chainsaw cuts, finger slippage over the conveyor belts, handling of rocks and stones in oil field and mines, dealing with slippery surfaces, etc. During any of them, hands automatically follow the reflexes of the brain and tries to protect the body against them. During the accidental contact, even the permanent damage to bones, ligaments and muscle tissues may happen. Impact gloves sold by Texas Safety Supply are constructed using high grain material that absorbs the impact and absorbs varied levels of pressures that might occur on the job site manufactured by Joker Impact Gloves. Jester MX 215 Oil Field Impact Gloves and Joker MX1137 Cut Level 5 Winter Oil Field GLoves are two examples of Joker Work Gloves that can help prevent hand injuries. Thermo plastic rubber, leather and other molded materials are used in the construction of oilfield gloves. Therefore impact gloves increase the time period between them and help disperse the impact away from skin providing needed PPE hand protection for the user.. The area that covers the knuckles is usually made up of TPR (thermoplastic rubber). The Hi-Spandex is sewed over the rest of the surface. Inside liner contains the foam material and sometimes extra cushioning of other materials like leather. The portions are constructed in order to maintain the dexterity constraints that offers confidence in handling various equipments and tools. The first and foremost step to prevent hand injuries is to purchase impact gloves with ANSI/ISEA rating. These Impact gloves are constructed as per the industrial standards and are purposely built to serve various different functions. You may find them from Impact Resistance with Cut level 1 to 5 with Level 5 being the most rigid and having the most protective hand protection. Additionally, take care of the size and fit since it is an important aspect to consider while choosing the one. Spreading awareness among fellow workers can help them remain safe and protected while working in Hazardous Oil and Gas jobs.